SR10-120 is ideal for the protection of critical information and telecommunications networks which cannot run the risk of being powered from a poor quality electrical supply. 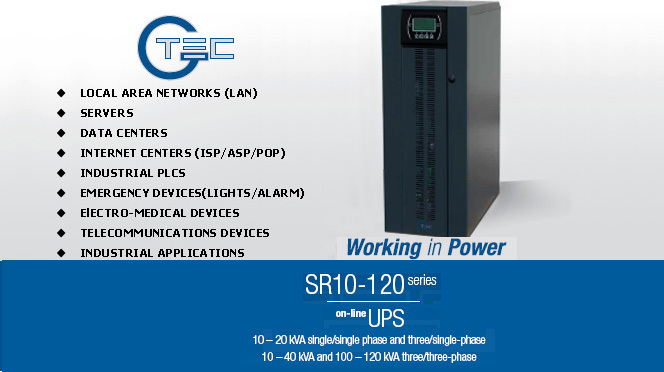 The SR10-120 series is available in 10-12-15-20 kVA three-phase and single-phase input and single-phase output models, and 10-12-15-20-30-40 and 100-120 kVA three-phase input and output models, with double conversion on-line technology according to the VFI-SS-111 classification, as defined by the IEC EN 62040-3 standard. 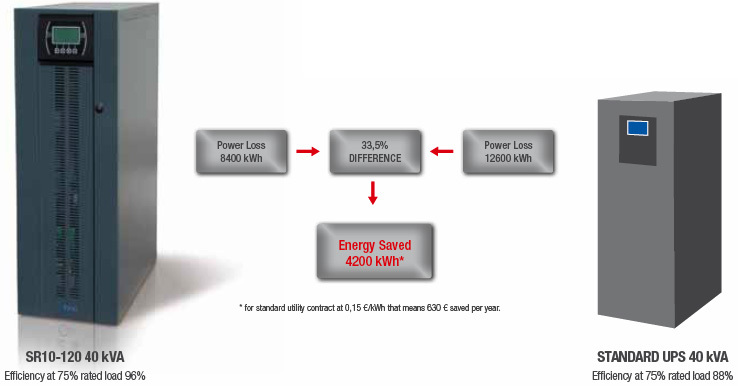 zero impact on the mains power supply and a high operating efficiency. thus eliminating any critical factors in the connection between UPS and system. 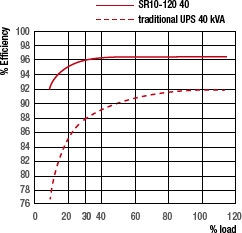 annum compared to traditional UPS products (92% standard). investment recovery within three years. F1, F2, F3, F4 = Function Keys. 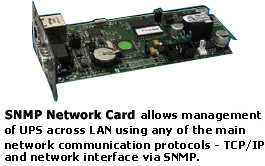 PowerShield2 provides user-friendly UPS management. 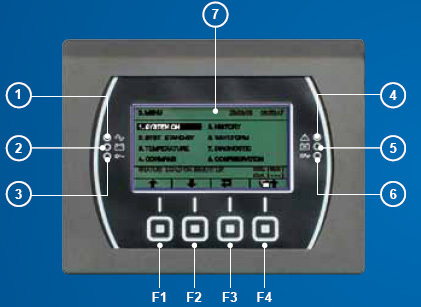 The software displays real time information in the form of bar charts and values for critical data such as mains voltage, UPS load and battery charge. It allows remote interrogation of UPS logs and operating parameters to help diagnose alarms and potential fault conditions. UPService, our technical assistance facility uses highly trained engineers to provide a reliable and competent technical support and after–sales service. A dedicated CALL CENTER for connection to the UPService organisation. UPService personnel are always available and ready to provide advice and assistance regarding UPS installation, maintenance, fault finding and repair. FAST AND READY A fast repair on site is guaranteed through the use of state-of-the-art UPS technology and professionalism of the UPService personnel and Authorized Assistance Centers. UPService guarantees that failed parts are replaced with original ones, tested and updated in order to maintain the safety, reliability and operating characteristics of the UPS. COMMISSIONING AND START-UP UPService can provide assistance during commissioning and start of the UPS equipment on-sit with additional training during handover to site personnel. UPService engineers can also verify site suitability, analyze and advise to potential problems, and disconnect and relocate equipment. UPService recommend that all hardwired installations are commissioned by UPService engineers. MAINTENANCE CONTRACTS can be provided by UPService to minimize response times and repair costs. Contracts range from periodic inspections to comprehensive cover including labor and materials. 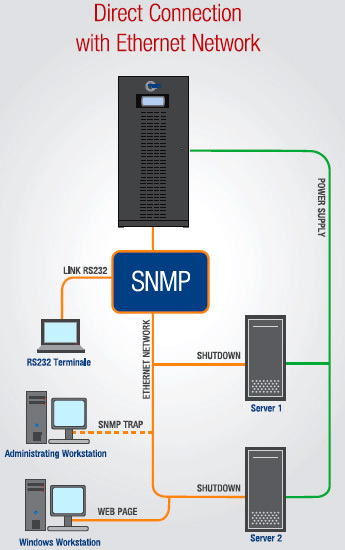 The TELEGUARD software package provides remote 24x7 UPS supervision. TeleGuard can interrogate G-TECH connected to a local telephone line check on their operating logs and system status. Should the UPS report an alarm condition, the UPService Call Center is immediately notified and a dedicated customer response activated. Routing site reports can be sent automatically to customer personnel. 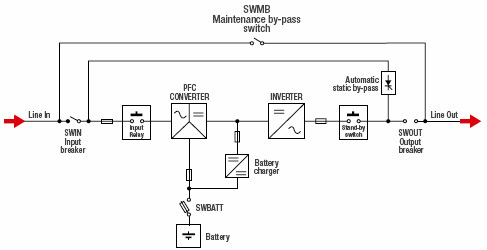 UPService organize regular TECHNICAL TRAINING COURSES for UPS operator and installers.